We have been doing lobstering trips out of Key West since the 80's. And we have fun doing it. Join our professional crew and catch some bugs (lobster). 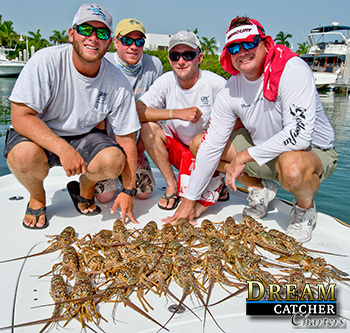 Come to Key West furring the lobster sportsman season (The last Wednesday and Thursday of July every year) and join us in the harvesting of the Florida Spiny Lobster. Recreational lobster season opens up on August 6th and we do lobster trips then as well (recommended). 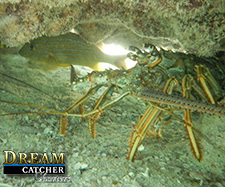 Getting more and more popular catching lobsters is a fun way to spend the day snorkeling with a purpose. These super tasty creatures sure make a nice addition to a Key West sunset dinner followed by a rum front truly helping you "Live The Dream" here in Key West. Lobstering is becoming a huge draw to Key West every year to enjoy our Lobster Fest festivities. Schedule a day with us to go catch some lobster. 4 hour private charter trips for 1- 6 persons. We have two different types of boats you can hire for charter. Either our 24 ft bay boat that holds up to 4 persons or our 28 ft center console that can comfortably take up to 6 persons. Rates vary depending on the boat and number of persons. See Rates below..
Lobstering here in Key West is allowed on the dates specified in the seasons. The last Wednesday and Thursday of the month of July is considered sportsman season. During the two day sportsman season lobster harvesters are allowed 6 lobster per person on board that is participating in the harvest of lobster. We carry the licenses for everyone on board.. If there is a person on board that is not snorkeling or looks like they are not harvesting lobsters, they will not be included in the bag limit. The captain is not part of the bag limit of lobsters. Lobster Sportsman Season 2017 Dates are July 26 and 27 - SOLD OUT..
We Do Not Offer Lobstering Charters After Mid October. To be effective in catching lobsters here in Key West one should be a decent snorkeler. It is not required to be a great snorkelers to go on this charter. Expectations of catch may exceed ones ability to catch lobsters, we will supply you all the tools you will need, show you how and give you all the chances we can to catch one. Your captain will not catch all of the lobsters for you. He may catch one for an example but you must figure it out and harvest your own, thats part of the fun. 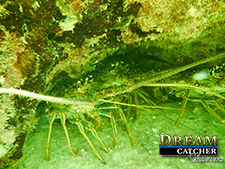 Depths of 5 - 12 ft are usual for snorkeling to catch lobsters. There are no guarantees that you will catch legal sized lobsters. There is no guarantee that you will come home with a limit of lobsters. We promise you will have fun trying. We will clean your catch for you by tailing your lobsters. Lobster Catching Charters book up in advance. Please call soon to reserve your days with us. We do not allow spear guns or pole spears on our boats. No Exceptions. 4 Hours Half Day $ 500.00 + $50.00 Extra Person over 2. We supply all your snorkeling gear, gloves nets and tickle sticks. We can accommodate 1-6 persons. Personal Snorkeling Gear, Weight Belt. We Would Like to Thank Those That Help Get Us There.